“The Notorious” Conor McGregor is the biggest star in MMA right now. He was born in Dublin, Ireland on the 14th of Juli 1988. He is the former featherweight champion and current lightweight champion of the UFC. He is the first fighter in history to hold two UFC titles in two different weight classes simultaneously. He is the highest paid athlete in MMA. “The Notorious” was also a two weight world champion in Cage Warriors. McGregor fought most of his career at featherweight but has also fought at lightweight and welterweight. 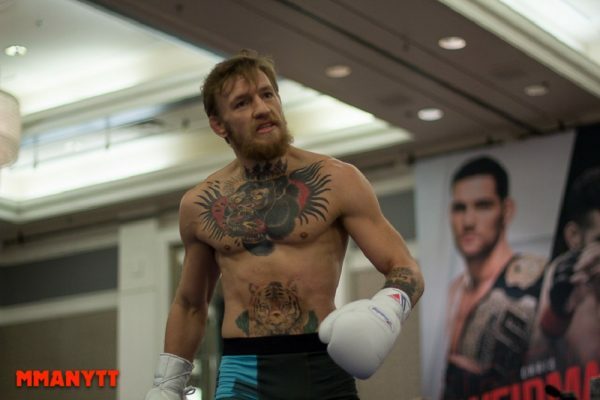 He fights out of Straight Blast Gym in Ireland, under head coach John Kavanagh. 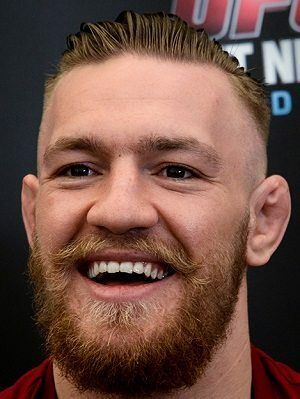 Before McGregor fought in MMA he played football and trained in boxing. He was working as a plumber before he decided to do MMA full time. His friend and training partner Tom Egan was the one who introduced McGregor to MMA in ’06 and took him to SBG Ireland. He fought his first professional fight against Gary Morris in 2008 and won via KO in the first round. He fought and won once more by TKO before he lost by submission to Artemij Sitenkov. After the defeat McGregor came back to the winners circle twice by defeating Stephen Bailey and Connor Dillon by TKO. He then fought his country man “Irish Joe” Duffy who at the time was undefeated with six straight wins. Duffy submitted McGregor in the first round by arm triangle choke. With a record of 4-2 Conor McGregor he continued in his career and won four straight fights by knockout before he got another shot to fight in Cage Warriors. He fought Aaron Jahnsen on CWFC: Fight Night 2 in Amman, Jordan in 2011. McGregor won the fight by TKO. After antoher win McGregor got a fight against the featherweight champion Dave Hill. The two fought at Cage Warriors 47 in Dublin. McGregor controlled the beginning of the fight en route to the first submission win of his career. McGregor then moved up in weight to face the lightweight champion Ivan Buchinger on Cage Warriors 51 in december 2012. After a brilliant knockout McGregor was now the two weight world champion in Cage Warriors. When UFC president Dana White went to Ireland to get an award, he was harassed by the Irish fans, telling him to sign McGregor. White ended up taking McGregor to dinner. The dinner went well and McGregor was offered a contract a couple of days later. McGregor made his UFC debut riding a eight fight win streak and being a double world champion. He fought Marcus Brimage on UFC on Fuel TV 9: Mousasi vs. Latifi in Stockholm Sweden. McGregor proved the hype was real and defeated Brimage by TKO in the first round. He got a Knockout of the Night bonus for the TKO. McGregor became extremely popular after his debut and got another fight against rising star Max Holloway. He defeated Holloway by unanimous decision. In the fight he sustained a knee injury and he was out of competition for about a year. 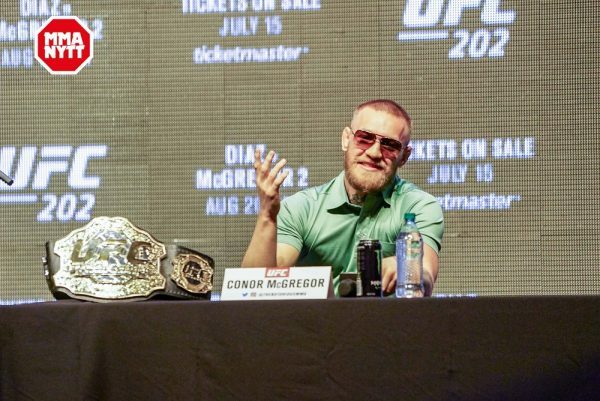 Conor McGregor was now more popular than ever and his new nickname “Mystic Mac” was starting to get a hold since he seemingly is able to predict the outcome of his fights. After beating Diego Brandao he continued his tear on the featherweight division by finishing Dustin Poirier and Dennis Siver, granting him a shot at champion Jose Aldo. They were supposed to fight in Las Vegas in july 2015, but a “boo-boo” as McGregor would call it, forced Aldo out of the fight and he was replaced by Chad Mendes for the interim Featherweight Championship of the World. This would be his toughest fight thus far in the UFC as Mendes took him down and controlled McGregor for a short period of time on the ground. McGregor was constantly working to his feet and front kicking Mendes in the body. In the second round Conor McGregor hit Mendes with a left that sent him crashing aganist the fence and McGregor finished him with ground-and-pound. The pay-per-view sold over a million buys which reassured McGregor of his star power. Having the interim title guaranteed McGregor a shot at Jose Aldo, the long time featherweight champion who hadn’t lost in ten years. After a world tour where McGregor and Aldo travelled all over and McGregor had ample opportunities to taunt his opponent, they finally fought at UFC 194: Aldo vs. McGregor in Las Vegas, Nevada in December of 2015. The fight ended after 13 seconds with McGregor landing a picture perfect left hook on Aldos chin. He broke the record for fastest finish ever in a title fight and ended Aldos reign and becoming the first man to knock him out. The event sold 1.2 million pay-per-views. Ever since joining the UFC McGregor was certain he could repeat the feat of becoming a two-weight world champion in the UFC. He was supposed to fight Rafael dos Anjos for the title but the champion had to withdraw with a broken foot. Instead he fought Nate Diaz in a fight which would become one of the most important moments in both mens careers. They fought in the main event of UFC 196: McGregor vs. Diaz in Las Vegas and the fight was contested at welterweight (170 lbs/77kg). McGregor hit Diaz early but gassed out in the first. He got stunned by a Diaz punch in the second round and went for a takedown. Diaz quickly took over and submitted McGregor with a rear-naked choke. The fight sold 1.3 million pay-per views. Putting out the blueprint in handling losses, McGregor regrouped and faced Diaz again at welterweight. He believed he knew what he did wrong and this next time would be different. McGregor refused to do it on any other terms than exactly the same terms as when he lost to Diaz the first time. 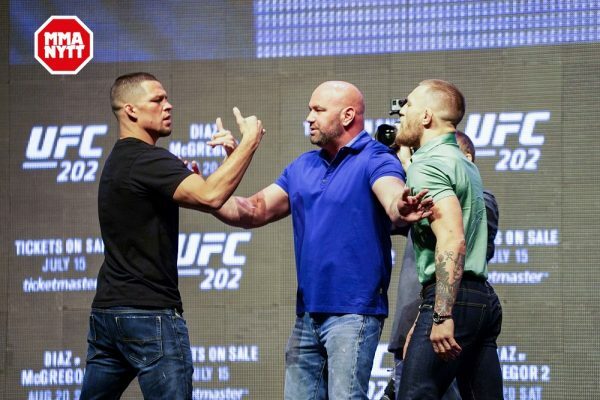 They finally fought at UFC 202: McGregor vs. Diaz 2. McGregor won the rematch by competitive unanimous decision and the trilogy will surely follow. The fight became an instant classic and was nominated for Fight of the Year and beat the overall PPV-record set by Brock Lesnar by selling 1.6 million pay-per-views. Even though Dana White promised that Conor McGregor would defend his featherweight belt after fighting Diaz, he threw McGregor another bone. He got the opportunity to realize his dreams of becoming a two-weight world champion in the UFC when he got offered the main event in UFC’s first trip to Madison Square Garden, against lightweight champion Eddie Alvarez. UFC 205: Alvarez vs. McGregor was held in New York on November 12th. In the main event McGregor made quick work of Alvarez and knocked him out in the second round with a Mortal Combat like combo. With the win he had to relinquish his featherweight belt. McGregor announced he would take a break until after the birth of his son, not to stress out his gilfriend Dee Devlin. During his time away rumors were floating around that McGregor wanted to fight boxing great Floyd Mayweather in a boxing fight. After Mayweather unretired and called out McGregor the fight seemed even more likely to happen. On June 15th it was announced that the fight had been signed. It would go down at T-Mobile Arena in Las Vegas, Nevada on August 26th. He is set to make atleast 100 million dollars for the fight. 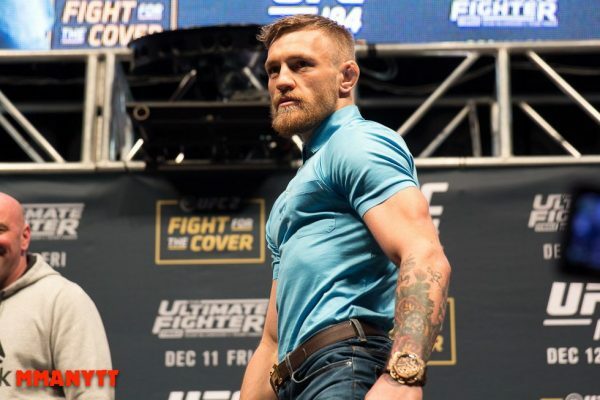 Conor McGregor is the highest paid fighter in the UFC. Below is a breakdown of his income for his last five fights. Note that it’s only the base pay, it doesn’t include discretionary bonuses or PPV bonuses.